FRANKLIN, Mass. – For the Franklin boys basketball team, terrific defense led to easy offense. And that combination resulted in a dominant performance and a comfortably 57-36 win over visiting Attleboro. The Panthers flipped a two-point game upside down with a 20-0 run over the final six minutes of the second quarter to pull away from the Bombardiers, who entered the contest with a chance to win at least a share of its first Kelley-Rex title. Franklin limited the visitors to just 22% shooting from the field in the opening half as the Bombardiers couldn’t find a connection from deep, going just 1-for-17 from three-point range. And with consistent stops, Franklin’s pushed the pace and cashed in with an impressive transition offense, converting some easy looks down low. Franklin shot 65% from the field in the opening half, making 12-of-18 shots from two-point range. While Attleboro only had four first half turnovers, it couldn’t solve the Panthers defensively. 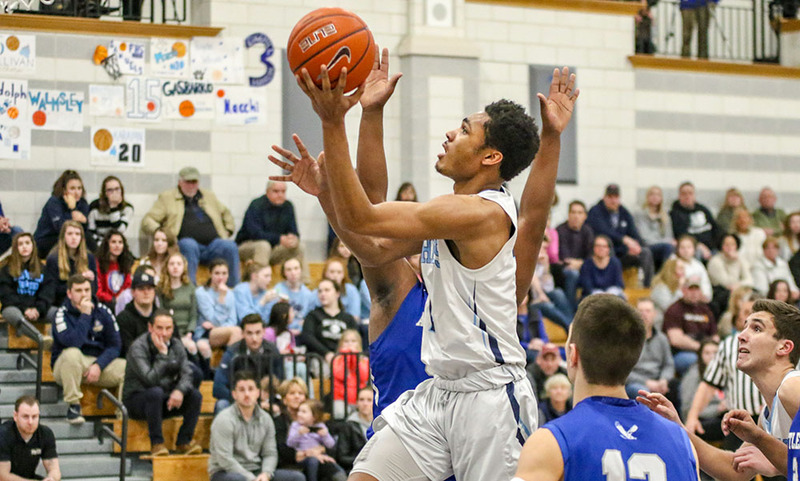 During Franklin’s game-changing run, Attleboro only had one turnover on a shot clock violation, and 0-for-11 from the field, with eight of those shots coming from three-point range. “They did everything better than us tonight, offensively and defensively,” said Attleboro coach Mark Houle. “They made us really feel uncomfortable all night, and we didn’t have any answers. Franklin led 15-7 after the first quarter but Attleboro opened the second quarter with a quick 5-0 run to make it a two-point game. Bryant Ciccio (11 points) drained a three and Kevin Velazquez picked off a pace and went the distance for a layup to make it 15-13. From there, it was all Panthers. Jalen Samuels (15 points, nine rebounds, four assists) converted his own putback and then scored off a feed from Chris Edgehill (seven points, seven rebounds, seven assists). Will Harvey (career-high 19 points, nine rebounds) sank a three-pointer off a feed from Jack Rudolph, then Edgehill came down with a defensive rebound, pushed it up court and found Rudolph for two. Samuels then drove to the basket, drew in the defense and dished it off to Harvey for an easy two and a 26-13 lead with 3:43 left in the second quarter. The Bombardiers tried to shoot their way out of the funk, taking six triples on their next seven possessions. The lone trip that didn’t result in a three-point attempt was a turnover on a shot clock violation. Meanwhile, Franklin continued to cash in on the offensive end. Edgehill got some space in the lane for two, Jake Macchi (nine points) sank a three on a pass from Rudolph just moments after Samuels blocked an Attleboro three, and Samuels scored in low on a floater to put Franklin up 35-13 heading into halftime. The second half was much more even than the first, but the damage was already done by the Panthers. Tim Callahan made Attleboro’s second triple of the game with 2:44 left in the quarter (2-for-21 from deep through three), Ciccio added five points, including Attleboro’s only two free throws in the game, and Qualeem Charles (eight points, 10 rebounds) got an early bucket, but Franklin got points from Macchi (a three), Harvey (five) and two apiece from Edgehill and Rudolph to hold a 47-24 advantage entering the fourth. Attleboro’s defense limited the Panthers to 10 points in the fourth, but only scored 12 on its own. Mason Houle sank two threes in the fourth, the latter cutting the deficit to 15 points but with only three minutes to go. Harvey added four in the final frame and Matt Lazarek came off the bench to hit a triple for the Panthers, who shot 56% from the floor for the game and dominated the rebounding battle, 33-18. Franklin boys basketball (12-4 Hockomock, 14-5 overall) is back in action on Sunday with a noon tipoff against New Bedford. Attleboro (13-3, 16-4) will try to bounce back when it travels to rival North Attleboro for a non-league clash on Monday. King Philip, 54 @ Attleboro, 58 – Final – Attleboro senior Mason Houle hit a big three and junior Qualeem Charles sank two big free throws as the Bombardiers held off an upset bid from King Philip. Houle (15 points) took a feed from Kevin Velazquez (nine points) and drained a three to make it 56-48 with 1:20 to play. KP’s Bruce Saintilus (21 points) answered with a three of his own to make it 56-51. After a stop, Tim Nault sank a three for the Warriors to make it 56-54 with 39 seconds to play. Charles (13 points, eight rebounds) hit two free throws with 12.4 left to secure the win for Attleboro. Tim Callahan added 13 points for Attleboro while Alex Fritz finished with 13 points for the Warriors. 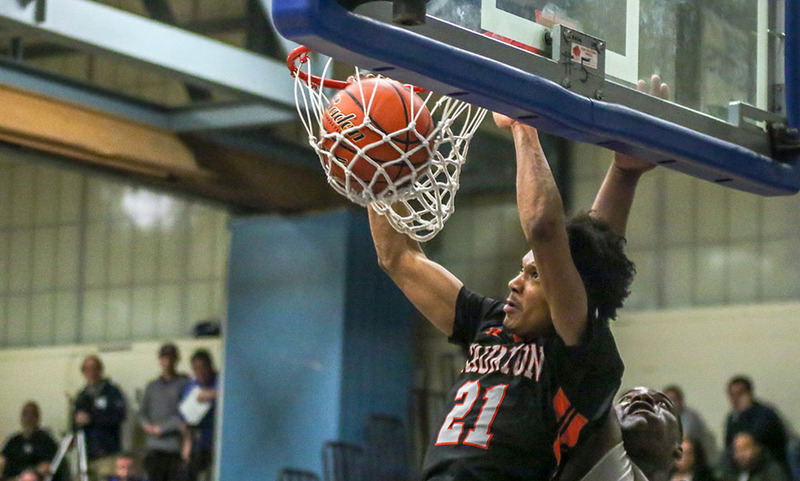 Sharon, 43 @ Canton, 69 – Final – Canton senior Devin Foster scored 31 points to lead the Bulldogs to a win. With the victory and other results from the Davenport division, the Bulldogs clinched at least a share of the division title. Stoughton, 62 @ Foxboro, 53 – Final – Click here for a recap and photo gallery from this game. Franklin, 67 @ Taunton, 49 – Final – After an even first quarter, Franklin controlled the final three periods to secure a win on the road over Kelley-Rex rival Taunton. Tied at 12-12 through eight minutes, Franklin created a 30-23 lead heading into the halftime break. The Panthers then extended the lead to 49-33 after three and never looked back to get the win. Franklin junior Chris Edgehill scored 17 of his game-high 22 points in the second half, Jalen Samuels added 14 points, and both Jake Macchi and Will Harvey (all points in the first half) finished with 10 points apiece. Dante Law had a team-high 10 points for the Tigers. Mansfield, 60 @ Oliver Ames, 51 – Final – Mansfield connected on nine three-pointers and found success at the free throw line to return home with a win over Oliver Ames. 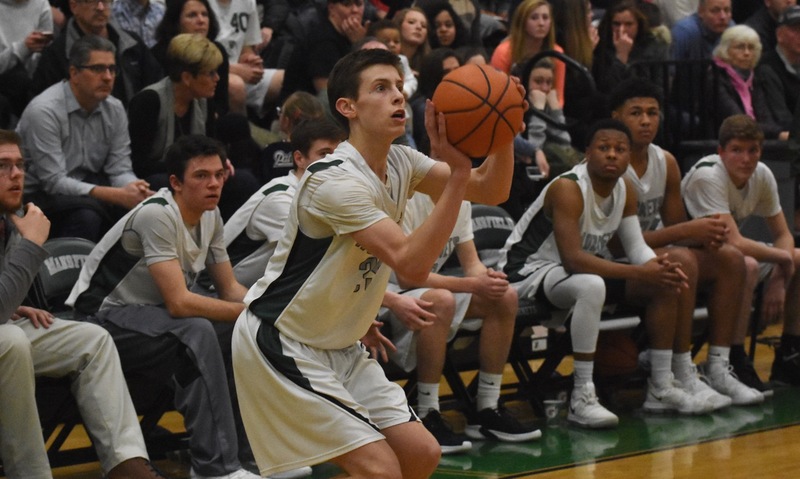 Sophomores TJ Guy and Matt Boen each had 16 points for the Hornets, who held a three point lead at halftime (29-26) and entering the final quarter (45-42). Sam Stevens scored five of his eight points in the final quarter for Mansfield. Milford, 53 @ North Attleboro, 63 – Final – North Attleboro was perfect from the field in the fourth quarter, going 9-for-9, and poured in 31 points to complete a comeback win over visiting Milford. The Rocketeers were limited to 16 points in the first half but equaled that total in the third quarter. Trailing 41-32 after three, the Rocketeers opened the fourth with an 8-0 run to get back into the game. Junior Ethan Friberg (11 points) hit a pair of threes in the fourth, sophomore George Ladd added 10 points (all in the second half), and Nate Gonsalves scored all eight of his points in the final quarter. Senior Josh Montague scored a team-high 19 points while Josh Porter added nine points, including a big layup in the fourth quarter. Brendan White had a team-high 14 points and Brendon Sailer added 13 points for the Hawks. Attleboro, 44 @ King Philip, 63 – Final – Faith Roy set a career-high with 22 points to lead the Warriors to a win that clinches a state tournament berth. Shannon O’Connor and Faye Veilleux chipped in with 12 points apiece for KP. Sharon, 48 @ Canton, 65 – Final – Kiara Cerruti scored a career-high 25 points to lead the Bulldogs to their 11th win this season. Defensively, seniors Maggie Connolly and Julia Hamilton combined for 14 steals in the win. Emma Eberhardt scored 19 points in the loss and Telishya Herbert added 15 for the Eagles. Foxboro, 79 @ Stoughton, 36 – Final – Katelyn Mollica had 25 points, including seven three-pointers, to lead the Warriors to a division win. Yara Fawaz had 16 points and Abby Hassman and Chelsea Gibbons each scored nine points in the win. Taunton, 37 @ Franklin, 82 – Final – Franklin clinched the outright league title with the win. It’s the first title since 2013 for the Panthers. Eleven different players scored for the Panthers in the win led by Ali Brigham with 20 points. Bea Bondhus added 16 and Megan O’Connell had 13 in the win. Sonya Fernandez was Taunton’s top scorer with 12. Mansfield, 45 @ Oliver Ames, 39 – Final – Maggie Danehy led the way for the Hornets with 16 points and 12 rebounds. Mady Bendanillo added 10 ppoints, four assists, and three steals in the win. OA closed the gap in the fourth quarter, cutting an 11-point lead to just six, thanks in part to freshman Caroline Peper, who scored 14 of her game-high 21 points in the fourth. North Attleboro, 55 @ Milford, 19 – Final – Liz Smahi and Julia Kleczkowski each scored eight points for the Rocketeers. Foxboro, 9 @ Stoughton, 2 – Final – Brendan Tully netted a hat trick and Kirk Leach scored twice as the Warriors skated to a win over Stoughton at Asiaf. Sean Doherty and Carter Gerome each scored for Stoughton.